Attract larger birds to your existing Droll Yankees tube feeder and minimize dropped seed using the Droll Yankees A-6 Seed Tray. This lasting, plastic tray attaches to the base of your existing Droll Yankees Classic, New Generation, Bird Lovers, and Ring Pull tube feeder (not included) with its threaded plug. Its 7.5" diameter offers places for birds to sit and dine, and also captures excess seed which falls from the ports. The center hole and rubber plug make installation quick and simple, and the tray can be removed just as easily for versatility. 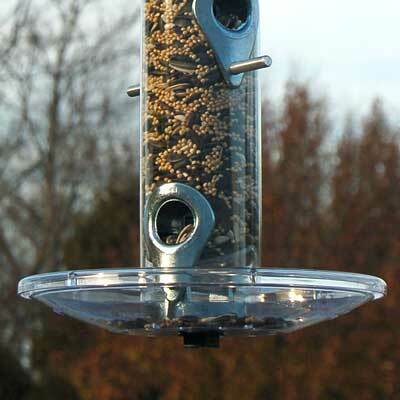 Increase the birds which can use your existing tube feeder with this A-6 Seed Tray. Made in the USA. Note: This description refers only to the Droll Yankees A-6 Seed Tray. A feeder is not included.